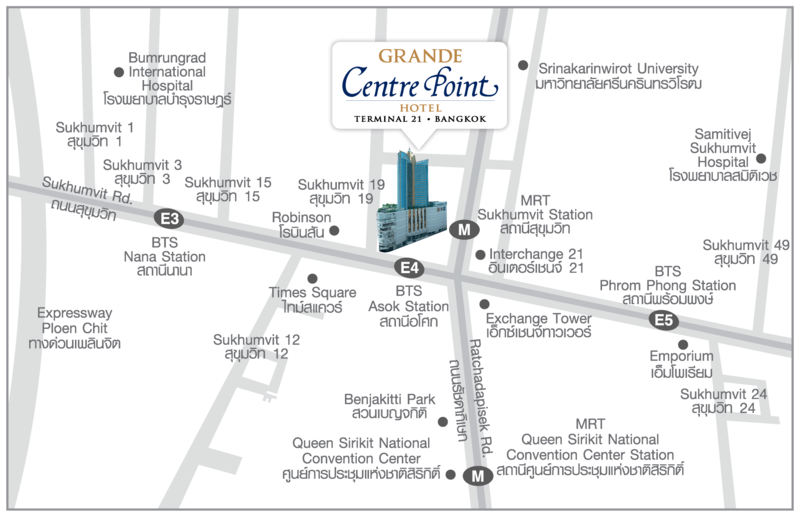 The venue of the conference is "Grande Centre Point Hotel Terminal 21". The hotel is conveniently located in the center of Bangkok, next to two train stations (Asok station on the elevated BTS Sukhumvit line and the Sukhumvit station on the underground MRT line). The service is provided by Airport Authority of Thailand. The airport limousines service charges by distance based on the car type. The travelling distance between the airport and the hotel should be around 45 km. Alternatively, you may contact the hotel for a limousine service provided by the hotel with extra charges. There is a taxi rank on the 1st Floor, Gates 4 and 7, of the Terminal Building. The fare is according to the distance plus the airport fee (50 THB) and expressway tolls. It should cost approximately 10 – 15 USD to the hotel, depending on the traffic condition. The taxi rank is organized by the airport. Do not use the taxis parking outside the rank. If you do not have many luggage you may try the convenient Airport Rail Link. 3.1	Alight the Airport train at Makkasan Station and transfer to the MRT underground train for Sukhumvit Station. This is a shorter route but luggage checks at the MRT station are required. 3.2	Alight the Airport train at Phaya thai Station and transfer to the BTS sky train for Asok Station. The most convenient way to travel from Don Mueang Airport to the conference venue is by taxi. The airport taxi rank is located along the arrival platform in Terminal 1 (1st Floor at entrance No. 8). The fare is according to the distance plus the airport fee (50 THB) and expressway tolls. It should cost approximately 12 – 17 USD to the hotel, depending on the traffic condition. The taxi rank is organized by the airport. Do not use the taxis parking outside the rank. The Grande Centre Point Terminal 21 hotel has a situation update web page. It also provides the hotel’s location.